Carbonara Day was established in Italy last April 6 as a way to hail a particularly delicious pasta that most believe was first made in mid-20th Century Rome as a hearty meal for Italian charcoal workers. 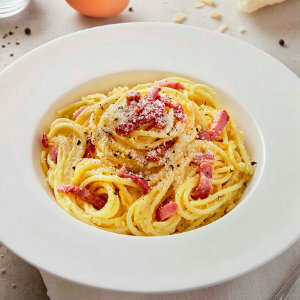 Casa Barilla at South Coast Plaza will celebrate the second annual Carbonara Day by introducing Chef Alfonso Sanna’s signature Pasta alla Carbonara on April 6 and keeping it as part of the Barilla menu until May 6. Almost every Italian chef will cook Carbonara it as he or she sees fit, and Chef Alfonso is no exception. His Pasta alla Carbonara is made with Barilla Thick Spaghetti, Crispy Bacon, Pasteurized Egg Yolk, Parmigiano and Pecorino Cheese, a Touch of Cream, and Crushed Black Pepper. Level 1, Sears Wing at South Coast Plaza in Costa Mesa. 657.205.1025.